Click HERE to return to Gallery Index, or HERE to return to the Dollhouse Miniature Gallery Index. I have been interested since childhood in all things miniature. At one stage my teachers asked me to write larger. *lol* I started doing miniature art in late 1990s and joined the "Australian Society of Miniature Art". One of my artworks was accepted into an exhibition that traveled to Europe and Britain, and to galleries in Australia in 2001. But I still like to do more 'casual' work, and love doing paintings suitable for hanging in dollhouses. This is a record of those works. Images are 150 pixels. Clicking on an image will show a larger image (actual size), if available. I collect miniature art, and have a roombox that is a miniature art gallery. 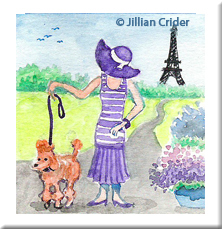 See my 'Jillian Crider.com' website to see this - HERE. Size: Approx. 2" x 1.75"
Details: SOLD. 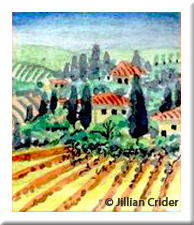 To cater to tastes of miniaturists who wanted Tuscan themed paintings for their dollhouses and room boxes, I did a series of Tuscan themed artworks. It was done in a group setting if I remember rightly. They were fun to do. Medium: Original Watercolor + Ink Miniature Painting. Details: SOLD. Another of my Tuscan themed artworks done in a group making themed dollhouse miniature paintings by request. Size: Approx. 2" x 1.6"
Medium: Original Watercolor Miniature Painting. Details: SOLD. Again, working in a group on themed paintings, this time with a French / Parisian theme. Done by request. These are representative of 1920's flapper girls visiting exotic Paris, with fashions from that era. Size: Approx. 1.5" x 1.5"
Details: SOLD. Continuing on with some requested French / Parisian theme miniatures. 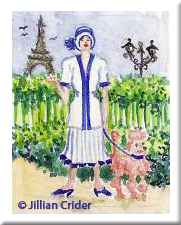 Featuring 1920's flapper girls, possibly on a visit to Paris. Wearing fashions from this time. ♥ M-035 "Paris Spring Bouquet"
Details: SOLD. Yet another of this series of requested French / Paris themed miniatures. Again with 1920's flapper girls on vacation in Paris and decked out in the latest fashions of the time. Size: Approx. 2" x 1.8"
Details: SOLD. At least these were fun to do - a series of requested miniatures based on a French / Paris themed. Featuring girls and fashions from the 1920s. Size: Approx. 2.5" x 1.2"
Details: SOLD. A stormy beach scene. A simple ocean seascape, but one of my favorite scenes in real life. This one sold quickly so it seems it's a favorite for many. 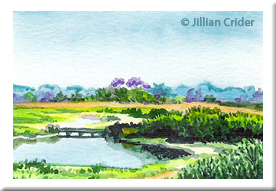 ♥ M-038 "Dry Creek Wetlands"
Size: Approx. 1.7" x 2.5"
Details: SOLD. One of my first attempts at capturing a landscape in miniature and one I ended up loving. A bridge over tidal wetlands. A lovely expanse and also diversity in colors. Size: Approx. 2.5" x 1"
Details: SOLD. I still remain fascinated by long, thin paintings. Be they horizontal or vertical. But my curiosity in this composition lead to me experimenting with my miniatures. And seascapes / ocean sunsets are a favorite of mine. 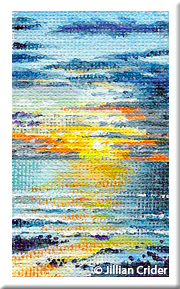 ♥ M-040 "Calm Ocean Sunset"
Size: Approx. 2.7" x 1.6"
Medium: Original Acrylic on Canvas Miniature Painting. Details: SOLD. Having done one sunset in watercolors, I decided to try one in acrylics. I did it on canvas, but think it would have worked out better if I'd used a smooth gesso, or smoother surface. But it was fun to do, and I was reasonably happy with the resulting painting. Great colors. 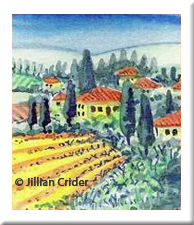 © Jillian Crider (artistjillian) - All images on this site are copyright 2011-2018. Commissioned artwork, illustration work, and licensing enquiries welcome.